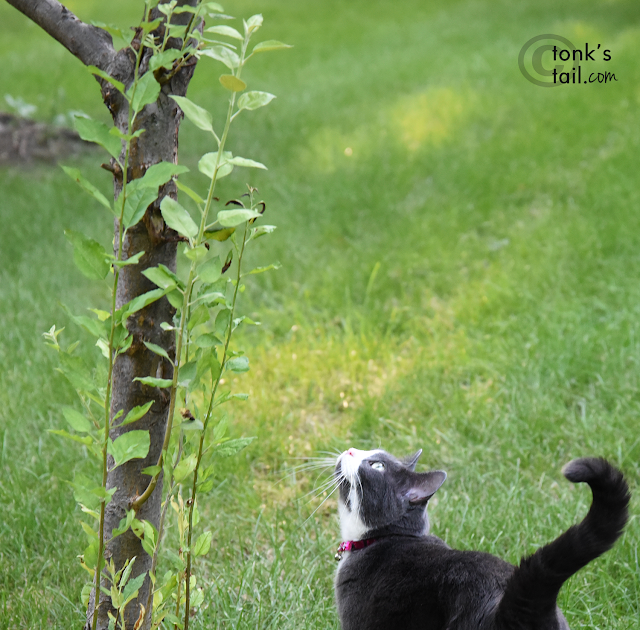 Wordless Wednesday goes to the Birthday Girlcat this week! "Hullo, apple tree. Please don't drop anything on me..."
Is it apple time? We can't even grow apples here - we don't get enough seasons. Looks like ya escaped da apples! Apples can be inspirational if they hit you on the head, Allie!! If you don't want an apple to drop on your head, don't stand under the apple tree..
You have such a cool yard, Allie! Maybe you can climb up there and knock all them apples down so you don't have to worry about getting knocked by one. An apple tree would be awesome to have in our yard. The boys would prefer a banana tree though. Unfortunately, neither will grow here but we do have pecans trees everywhere. New collar or not, you always look so glam, Allie! So you don't want to be Allie Newton? You look lovely Allie, even with last year's collar. Nice photo, but you are right, the new collar really would make for a better photo! I'm a collar girl myself. We wouldn't want anything to hit your pretty head, Allie. That would hurt to get bonked by an apple. But what's in the tree that was so interesting? Maybe you need a nice pink hard hat!